The future is here and scientifically proven! 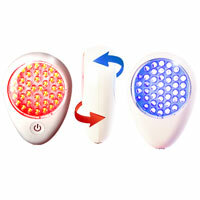 No matter what your age, skin type, or skin tone, the blue and red lights treat and heal acne anywhere on your body. How does Clear Rayz help with my inflammatory acne? Blue light kills acne-causing bacteria. Red light reduces the inflammation associated with breakouts.